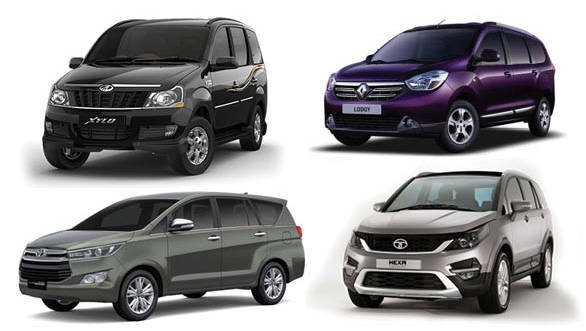 With the launch of the Toyota Innova Crysta and the upcoming Tata Hexa, the MPV segment is about to see major changes in the near future. The Toyota Innova has been the company's most successful car in the country, and the Innova Crysta marks an all new generation for the MPV. The Tata Hexa is based on the company's Aria platform which didn't fare well the first time round and will be launched sometime in June 2016. These two will have to take on established MPVs in the segment, like the Mahindra Xylo and Renault Lodgy. We take a look at how these updated MPVs take on the competition in terms of tech specs. The new Toyota Innova Crysta comes in two diesel options, a 2.4-litre and a 2.8-litre turbocharged engine. The 2.4-litre produces 150PS and 343Nm of torque which is a major stepup (50 per cent boost) from the outgoing Innova's 2.5-litre powerplant. The top end 2.8-litre makes 174PS and 360Nm of torque. The Tata Hexa gets the Safari Storme's Varicor 400 engine which is a 2.2-litre diesel generating 156PS and 400Nm of torque, The Mahindra Xylo has a 2.2-litre turbocharged diesel engine producing 120PS and 280Nm of torque, while the Renault Lodgy gets the smallest powerplant with a 1.5-litre engine producing 110PS and 245Nm of torque. It is also worth noting that the Lodgy is the lightest amongst the competitors, sitting at around 1,338kg, so its power to weight ratio is easily the best amongst the four. Sitting 4,800mm long and 2,000mm wide, the Tata Hexa is the longest and widest in this comparison, closely followed by the Toyota Innova Crysta in terms of length at 4,735mm. In comparison, the Xylo and Lodgy are a fair bit more compact at 4,520mm long and 1,850mm wide, and 4,498mm long and 1,751mm wide respectively. In our tests with the Mahindra Xylo, we found that it gave an overall economy figure of 12.5kmpl, while the Renault Lodgy gave a respectable 14.6kmpl. While we haven't tested the Innova Crysta for its economy figures, the outgoing Innova gave us 11.8kmpl, so it's safe to say the Innova Crysta will get a figure close to 13kmpl. The same goes for the the Tata Hexa  while we havent driven it, the Safari Storme which shares the same powerplant gave us 14.2kmpl, so we expect the Hexa will deliver a similar figure. The Mahindra Xylo is the least expensive option here, starting at Rs 8.57 lakh and going up to Rs 12.18 lakh. The next in line is the Renault Lodgy, which starts at Rs 9 lakh and goes up to Rs 13.31 lakh. The Toyota Innova Crysta is priced at a Rs 2 lakh premium compared to the outgoing model, starting at Rs 13.83 lakh and going all to the way to Rs 20.78 lakh. With the Aria being priced at around Rs 15 lakh, we expect the Tata Hexa prices to start at Rs 15.5 lakh, with the fully loaded model going for Rs 18 lakh. From the above prices, it is obvious that the Toyota and the Tata are aimed to be premium MPVs. All prices are ex-showroom, Mumbai.